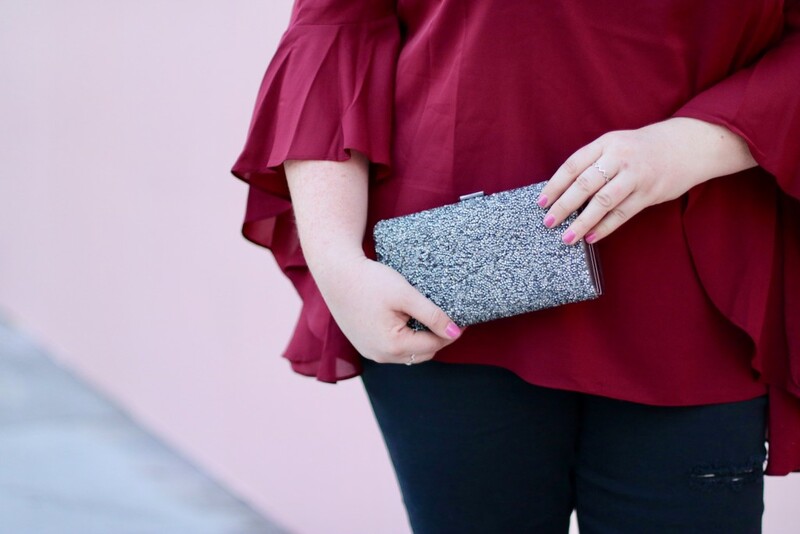 We’re right in the middle of Holiday party season and with all the events I have been attending lately, I’ve needed so many different types of outfits. The season is already busy enough and getting dressed doesn’t need to be one more stressful thing added to the list. I can always count on Macy’s as my one stop for all my holiday outfit needs. They always offer quality pieces at a great value and a variety of brands that I know will work for all my various holiday functions. First on my list was this gorgeous City Chic Dramatic Sleeve Top in Ruby paired with this City Chic Faux Leather Skirt. I love the combination of the dramatic sleeve with the off the shoulder look, a personal favorite. The best part about this look is that it’s fun and versatile. To add a little more edge for my night out, I paired it with these Steve Madden Over The Knee Boots and this cute, festive, INC Clutch. I am huge fan of City Chic and I love that I can find trendy and cute brands like this in my size at Macy’s. I loved this top so much that I actually created two different outfits! I needed a more casual look for another evening party so I paired the dramatic sleeve top from City Chic with these Celebrity Pink Studded Jeans. I really love a good distressed pair of denim and recently discovered this brand at Macy’s. The best part about this look is that the denim is chic and comfortable enough for all day wear. To make it more of an evening look, I added the studded INC clutch and paired it with my over the knee boots. What are you guys wearing to your holiday events?